Military survival gear – the very term brings in a sense of action, adventure, danger, excitement, adrenalin rush; everything that sounds, smells and seeps of danger and adventure, or a mix of both. Another way to look at it is hi-tech and sophisticated, high on utility, light on weight, multipurpose and everything that means survival even during the most difficult of times. Little wonder then, that some people are interested in military style survival equipment when it comes to back-packing, solo-camping, hiking or trekking…or just taking on life with all the battles in it! Some of the aspects that such gears focus on are camouflage, night-vision, location-identification, communication, signalling, survival and safety. Whatever the kind of equipment; military-based survival equipment are designed to be the best of quality, research-based and intended to offer the best survival support be it behind enemy lines or beyond the lines of civilization. And a lot of such equipment are available today; including online stores, and can offer you some of the best survival gear choices at moderate rates. So, what does a military survival gear look like or how can you put together a military survival kit. 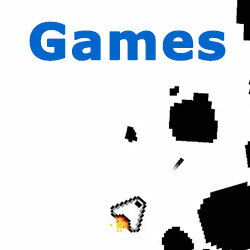 Well, the basis is survival and it needs to have all components that can ensure your survival. Therefore, most of these kits contain what any survival kit would – food, water, shelter, basic tools, safety equipment, safety devices, communication and navigation tools. Some of these equipments have been designed for the sole purpose of soldier survival and these are what are termed as ideal military survival equipment. Tents are an important shelter while out in the open. 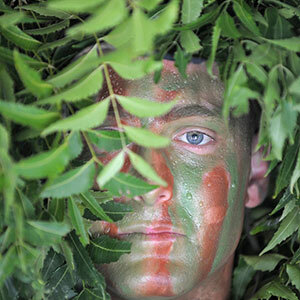 The army style tents come with camouflage, because often being invisible is the first step towards safety while camping in hostile territory. Such tents act as an ideal deceptive cover while at the same time offering protection from the elements of nature. They come in varying sizes and dimensions intended for a single person to a few people, family size shelters, dome-shaped tents, heavy duty tents, etc. They are designed to be held by ropes that are tied to the ground using anchors or stakes. Heavy-duty tools like axes, hatchets and saws are another important component when it comes to survival gear. They are not only important for splitting up timber and gathering firewood but also an essential warfare weapon. You can also find multipurpose hatchets and saws that can be used as hammer, prying tool, axe and nail remover. If your chances of being confronted by enemies – natural or otherwise, is minimal; then, you could opt for pocket-sized version of these tools. They not only save space in your survival gear but also reduce weight and are easier to handle and use. Some other tools that could make useful additions in your survival gear are fire starters or all-weather matches, camping stoves, camping utensils, camping toilets, sleeping bags, hammocks, blankets or all-weather blankets, foldable cots, insect repellents, personal care products such as tissues and wipes, knives and related accessories, sewing kits, repair kits, fishing lines, etc. Among these, some of the tools that are often an essential part of military survival gear include canteens, first-aid pouches, water purification and filtration mechanisms, meals and food supplies or supplements, solar chargers, etc. Canteens are, generally, hard containers that are used to carry liquids such as drinking water. It is commonly used not only by soldiers but also hikers; especially, when sources of water are unknown, unavailable or inaccessible. They are designed to be easy to carry but easy to access; so that you are hands are free to help you during your climbing, hiking or trekking activities. The caps are designed to be strapped or attached to the bottle, using a chain or strap to prevent it from getting dropped or lost. Another mechanism used for carrying water is the bladder. It is designed to be easily collapsible, when not in use, and is a plastic canister that can be filled easily. Water purification mechanisms such as filtration systems and purification tablets are another important component in military survival kits. They are intended to remove bacteria, bad taste, metallic contents such as lead or mercury, and other harmful contents such as chlorine. There are also other water clarifying agents that help to disinfect water from rivers, lakes and ponds. There are also pocket-sized filtration systems that help to convert natural water into drinking water. More sophisticated versions of water bottles with in-built filtration and purification mechanisms are also available. Meals and food supplements are another vital component. 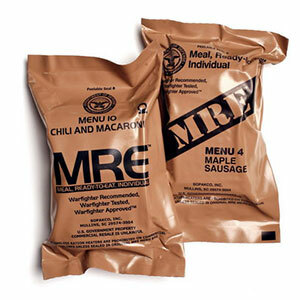 Meals, Ready-to Eat; also commonly known as MRE meals are basically food rations designed for individuals to manage their survival, while in the open or wilderness. These were predominantly used by the military where organized food facilities could not be arranged or were not available. These meal supplies are not only intended to be nutritious, to ensure sufficient energy, but also designed to be tasty and appealing. Because food, however healthy and nutritious, is still not a very attractive proposition when it is not tasty. Since, they are designed as a complete meal, it also includes water. Besides some commonly used tools, like sewing and repair kits, foldable knives, multi-purpose knife kit, bottle and can openers; there are also shovels and picks. These are designed to be light-weight and easy to use. They are made of strong metals such as iron or steel to ensure their durability and also to make it capable of digging, breaking and shovelling dirt or gravel. Some of these are also designed to be foldable to reduce space required, made with wooden handles to reduce weight, and attached with other tools to make it multipurpose. 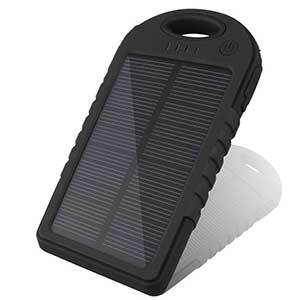 The latest addition to the communication and navigation tool set is the solar charger. They are not only portable and convenient but also easy to use and can store power efficiently. Some are even compact to fit into your trouser pockets and allow multiple charging of devices, simultaneously. These are an ideal charging choice when it comes to camping, trekking, fishing, hiking, or any outdoor activity that could possibly not offer you other choices of powering up your portable devices; especially, your mobile phones. The advantage of military survival gear is that they are often tried and tested and come with the guarantee of quality and reliability. And what better to fall back to when you are your only defence, while battling the outdoors!